Setup: Practice Pitch 30x60. Place a cone near centre field with a second cone 15 yds in front and a third cone 10 yds to the side of that. Copy the same setup on other side with side cone to the left of the net instead of the right. Activity: Player A starts the play by checking out to the side and demanding the ball. Player B plays them the ball and moves up towards where A vacated. 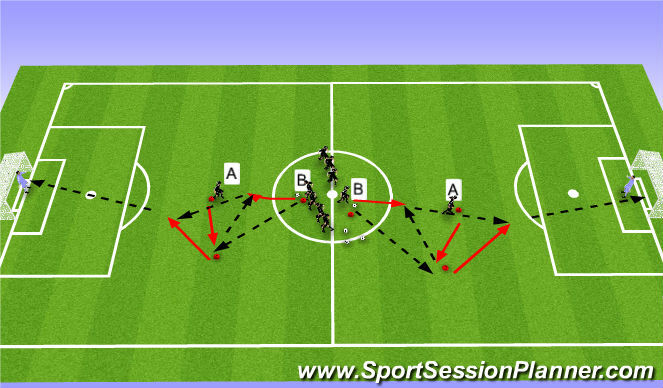 Player A one touches back to B and starts a run and player B plays a through ball to A who strikes on net. Player A collects ball and circles to other side and joins the back of line B. Good first touch towards goal.